What certification model is applied for the certification of Professional Engineers? The Professional Engineer certification is a competence-based certification for engineering professionals, which is not only based on the professional experience stated in their CVs, but rather on international standards that are in line with those developed by the Engineering Council of England or the American National Society of Professional Engineers. What degrees are required to become a Professional Engineer? Which competences and skills are evaluated? Only once these competences have been evaluated and certified by independent entities can a candidate’s academic background be considered at the same footing as that of European or American engineers. Why was the certification created? The reason was the fact that, on the one hand, the Bologna system led to great dispersion regarding degrees granted in the field of engineering and, on the other, that Spanish engineering has become international, which compels professionals to be in line with models used and accepted in other countries. To receive more information, please fill out this form and you will immediately receive an e-mail with an attachment containing full information. Continuous training activities are monitored each year. Likewise, every four years a recertification procedure must be completed. 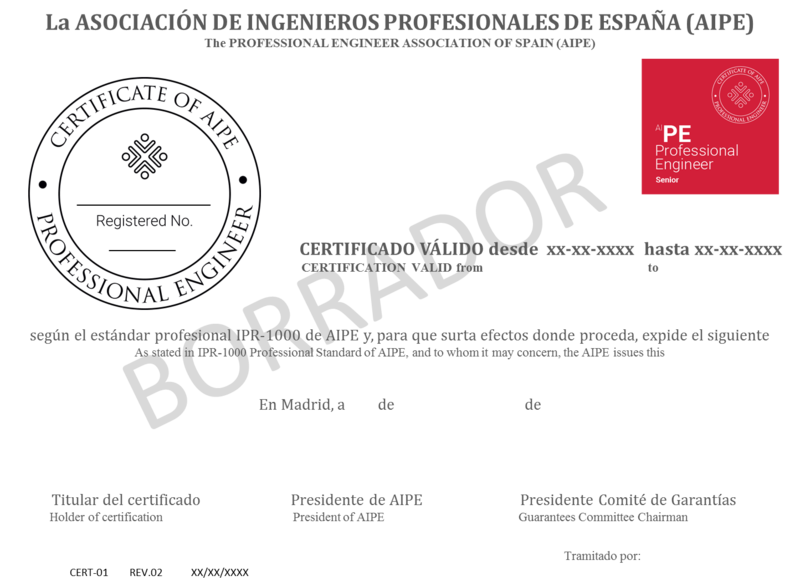 The only certification that does not expire nor is subjected to recertification is that of the Emeritus Professional Engineer (PEEM), since it corresponds to those professionals who are NO longer active in the profession due to retirement or a disability. What levels of certification exist? 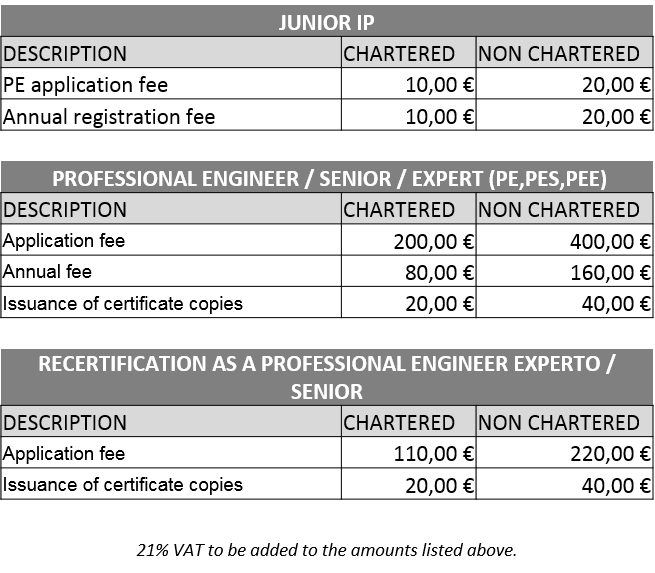 In order to be certified a PE at least 4 years of experience are required. Those with less than 4 years of work experience can join our association as Junior Professional Engineers (this figure is NOT a professional certification). Junior PEs are supervised by a mentor or a Professional Engineer, who will guide them through their professional development, also acting as a sponsor for the development of their professional competences. Level I: Professional Engineer: Certified engineer with a minimum of 4 years of experience –after having earned a degree–, gained 4 years before applying for certification and who has accredited experience built during that period, as well as a certain level of professional expertise. Level II: Senior Professional Engineer: Professional Engineer with 8 years of professional experience or more –after having earned a degree– and with the level of professional competence required for this category. Level III: Expert Professional Engineer: Professional Engineer with 16 years of professional experience or more –after having earned a degree– and with the level of professional competence required for this category. Finally, when a Professional Engineer under any of the categories mentioned above ceases to be active due to retirement or disability, he/she can maintain his/her certification as Emeritus Professional Engineer. For engineers: National and international recognition of their qualifications and expertise. For engineering service vendors: Guarantee of having qualified staff with the right expertise. For clients: It increases the certainty that their service vendors will provide them with top-notched services with the related benefits. For public bodies: It offers a market liberalisation vehicle through voluntary self-regulation. For insurance companies: It allows identifying risks more accurately for actuarial calculation purposes. For staff recruitment companies and HR departments: It provides an additional factor in the selection and decision-making process. For professional organisations: It adds value to its members and the organisation itself. For universities: It provides a value benchmark to graduates and to the institution itself. What is the certification like? What do PDUs consist in? Professional Development Units (PDU) are the units used to calculate activities. The table below shows the various categories of activities, their equivalents in PDU terms and the maximum number of PDUs that each category can contribute to the total annual minimum amount.